Having spent some time exploring Ubud we decided to head down to Kerobokan and then Seminyak to get a taste of the side of Bali while we waited for our visa extension. We would need to go to the immigration office near the airport to get our photo taken and fingerprints scanned. With May needing some rest to recover from her strep throat, we booked a room at Pandawa All Suites Hotel in Kerobokan. It was little more secluded than we imagined, but it gave us some peace and quiet. Maybe it was little too much peace and quiet; we couldn’t wait to get to the beach after a week of isolation in Kerobokan. Having gotten all of the relaxing we needed, and with her throat feeling better we decided it was time to head for the beach and have some fun. So we got a hotel room down the street from Double-Six beach in Seminyak. Time to enjoy some sun and fun, playing in the surf, and check out a couple of temples. This ended up being our favorite place in Bali, not as crowded and without as many touts as Kuta Beach, so we could just relax and play in the surf. It was so much fun to jump in the ocean, dive into the waves and feel like a kid again, not having a care in the world. After playing in the ocean, we lounged in the cabana area provided by our hotel, Hotel Horison, eating some delicious food and soaking the sun. At night, the restaurants at the beach set out beanbag chairs and set up stages for live music, which we really enjoyed. Sitting down, enjoying a cold beer while listening to music, we reflected on how lucky we were to be there, enjoying life. We were just beginning our second month on the road and it still didn’t seem real. Looking at the stars, absorbing the vibrations of the music, and feeling the energy of the ocean truly made Double-Six beach a special place for us. Watching people light lanterns and letting them drift up to the sky was an enjoyable experience. As they floated farther away, becoming a little light moving across the night sky, and finally resembling star as the last flicker of light faded away was a great sight to take in. 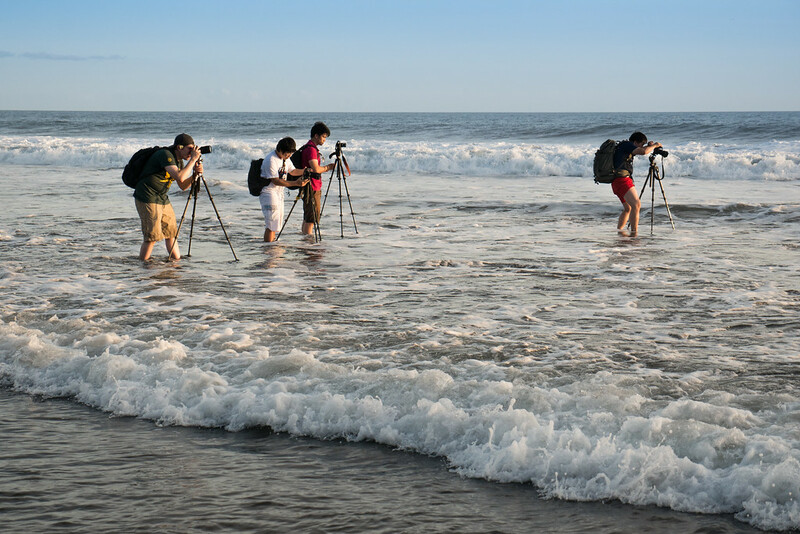 Making the beach all the more fun. Having taken in the beach, we decided it was time to go temple visiting. 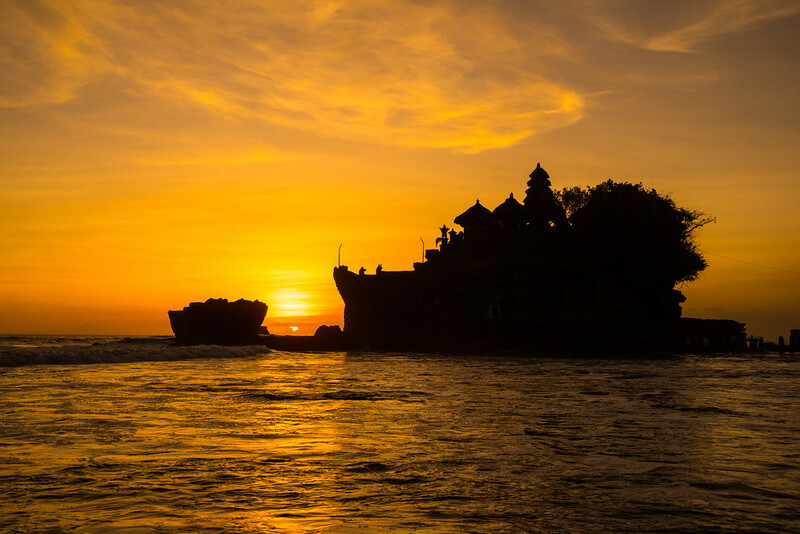 Tanah Lot temple, built on a rock just offshore, is an important directional temple on Bali and one of seven sea temples on Bali. 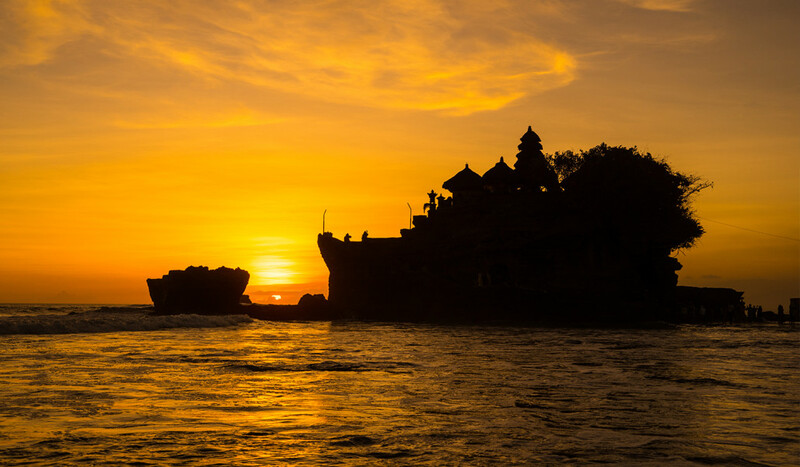 In Balinese, the name Tanah Lot means “Land (in the) Sea.” The temple is built to honor Dewa Baruna, a sea god in the Hindu religion. The ocean tide continuously shapes the rock and is only accessible during low tide. Due to erosion, the temple underwent a restoration in the 1990’s with one-third on the “rock” being very cleverly disguised artificial rock. Sunset is when it is at it’s most beautiful. 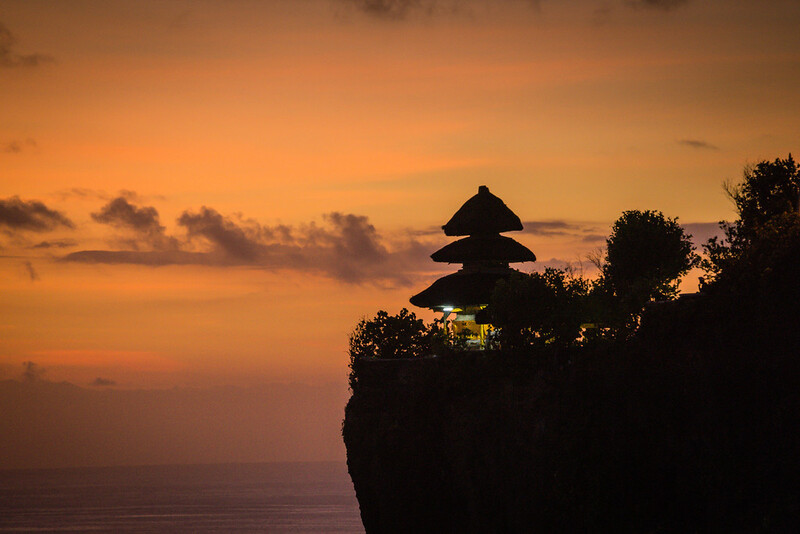 We hopped in a cab, negotiating with him to take us there and back; we headed to Tanah Lot to see the sunset. Once you enter the temple grounds you have to walk through a maze of souvenir stalls before you actually get to the temple. It was a little more touristy than I prefer, the stalls selling the standard tourist items found in the markets around Bali. After walking through the stalls, we made our way down towards the temple. It was low tide so we were able to wander down to the beach and over to the rock that the temple sat on. Unable to enter the temple grounds since it wasn’t open yet, so we walked around and scouted for a good location to view the sunset. At first we headed back up to the cliff that overlooked the temple but thought that the beach would give us a better vantage point, so we made our way back down to the beach. Finally finding a spot, setting up my tripod, we waited for the sunset to begin setting when we noticed people going up to the temple. A rush of disappointment set in, we had missed our chance to explore the temple, but we had found a good place to view what we hoped would be a beautiful sunset. We were not disappointed. Standing in the surf for the sunset was very fun. The tide slowly began to rise, the waves hitting my legs at a steadily rising rate as the sun steadily descended towards the horizon, the sky ablaze with an orange glow. As the ocean got higher I had to keep moving closer to shore until I found safe ground, darkness was beginning to set in, the sky became brilliant blue and purple, bringing joy to our eyes. At the end of the shoot, walking along the shore with our headlamps guiding us, we both felt happy to have seen such a pretty sunset. 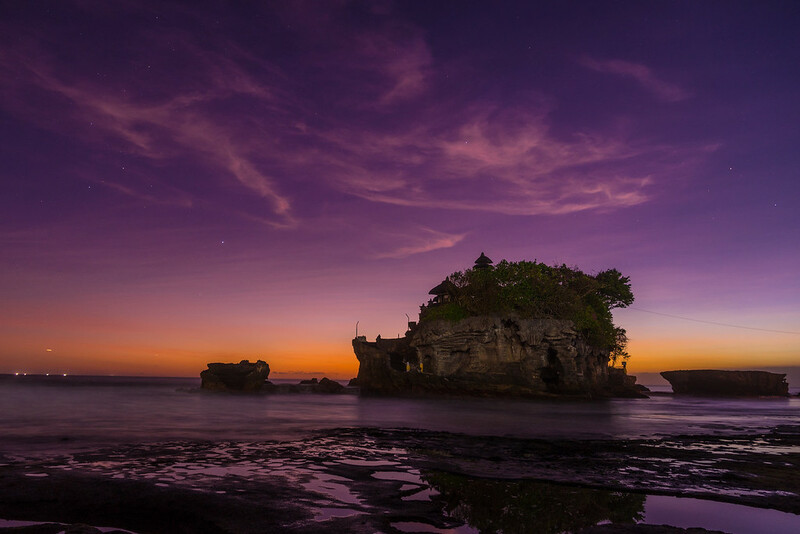 Tanah Lot is located about a 40-minute drive from Seminyak. There is not much transportation there so most visitors are part of a tour or hire a taxi or motorbike. Make sure you have some return transportation arranged or may get stuck there or pay a high price to get back to your lodging. 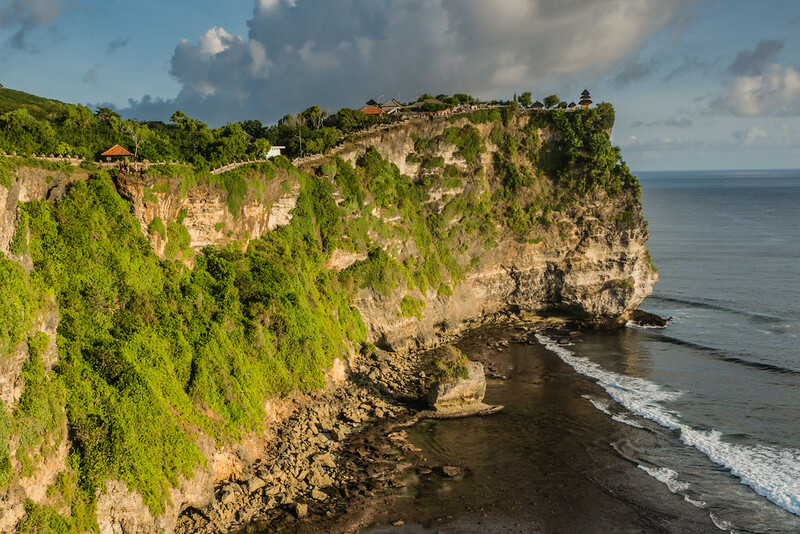 After going North for sunset at Tanah Lot, we decided to head South to other main Hindu temple on Bali, Uluwatu. 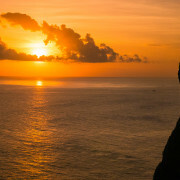 Uluwatu, located 70 meters above the sea on a cliff is another great place to sit and enjoy the sunset. 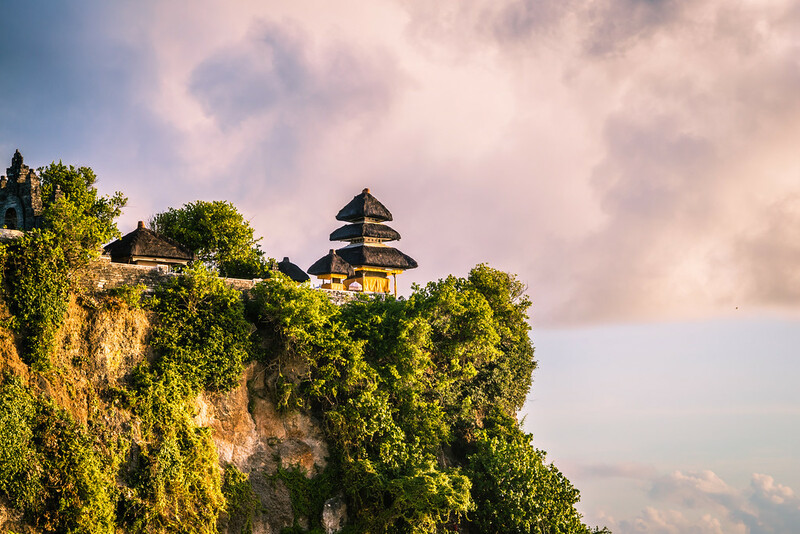 It, along with Tanah Lot, is one of the six temples believed to be spiritual pillars of Bali and an important directional temple. These temples are believed to protect against evil. 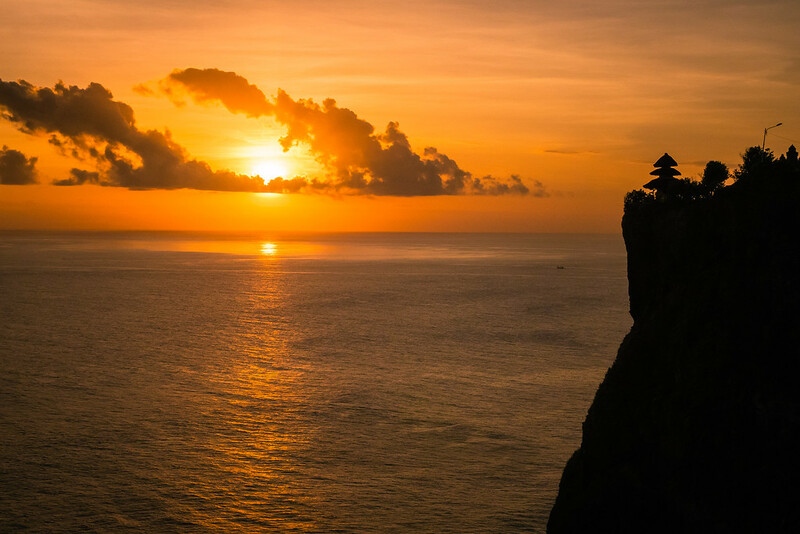 Not only can you get spectacular views of the ocean from the cliff it sits on, it also hosts a nightly Kecak dance. Not being satisfied with just seeing the sunset, we decided to take in the Kecak fire dance. 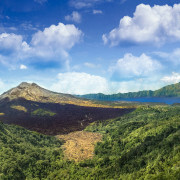 Since its location is on the Bukit peninsula, the most Southern part of Bali, we hired a driver to take us there and back. Sitting on the edge of a cliff, it gives way to beautiful views of the ocean and the waves crashing below. 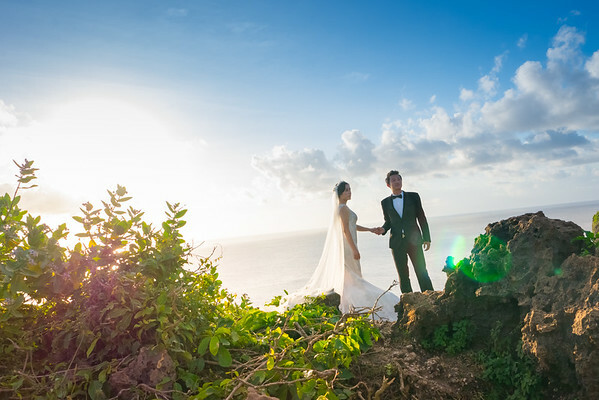 Pura Luhur Uluwatu in Balinese means “something of divine origin (at the) lands end rock.” We walked along the cliff edge trail to different vantage points, taking the beauty of the area and stopping to look at a Chinese couple getting their wedding pictures taken. Our driver accompanied us, making sure we didn’t have any trouble with monkeys that live at the temple. They are known for taking things such as sunglasses from tourists. As the sun began to descend towards the horizon, we made our way towards the stands that surround the stage where we would watch the Kecak fire dance. We picked our seats and had enough time before the dance started to enjoy the beautiful sunset.